Everyone loves bees don’t they? The recent revelations that our bees are in decline has prompted protests and petitions and have highlighted the vital service these buzzing pollinators provide to our planet. Yet many other pollinators which provide the same service don’t get the same level of public support. 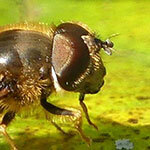 So in April I’m raising my banner for the hoverflies. No events in the calendar for the week ahead. Welcome to the website of the Sussex Biodiversity Record Centre, one of the many local environmental record centres situated around the UK. We provide environmental information services encompassing biodiversity, geodiversity and other aspects of Sussex’s natural capital. We cover the two counties of East and West Sussex, including Brighton & Hove, in South East England. We are a small but dedicated team of environmental data managers, naturalists and IT specialists. 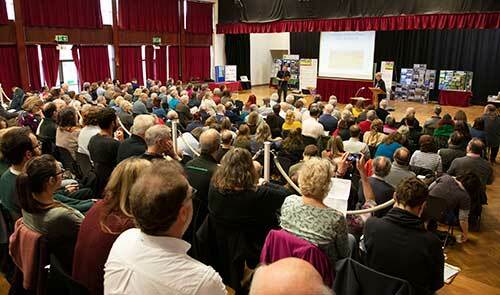 The Sussex Biodiversity Record Centre is managed as a partnership project, hosted by the Sussex Wildlife Trust. 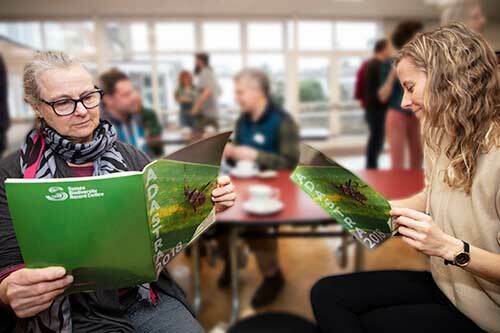 Our partners include local planning authorities, government agencies, conservation bodies and other organisations which need access to up-to-date biodiversity information, such as water companies. Sussex has a vibrant and energetic biological recording community with many independent recording groups and societies. By strengthening relationships with these groups, and the wider network of naturalists, ecologists and recording schemes active in Sussex, the Record Centre facilitates sharing of ever-greater amounts of biodiversity data. A rare caddisfly, Hydropsyche saxonica (Hydropsychidae) has been found at two sites, not far apart in Sussex, in the headwaters of the Gatwick Stream. The Environment Agency (EA) were carrying out a survey to look at the possible environmental effects of a flood alleviation scheme. 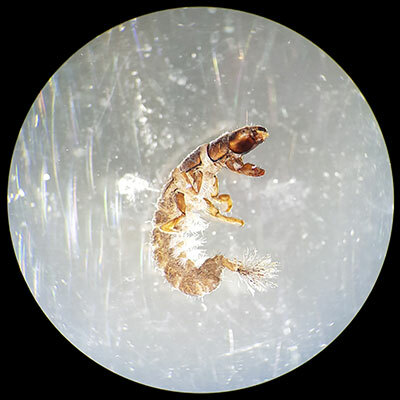 They came across the larval stage of the caddisfly in the samples of aquatic invertebrates. The EA knew that this was a caddis with a restricted distribution in the eastern part of the UK. They were delighted when Bob Foreman at the SxBRC let them know that these were the first confirmed records for the species in Sussex. The larva of Hydropsyche saxonica look similar to Hydropsyche fulvipes and markings on the underside of the head and the shape of ventral chitinous plates (the pro-sternites and the submentum), are used to tell them apart. In Central Europe both species are associated with headwaters, with saxonica generally extending further downstream than fulvipes (Pitsch 1993 cited by Edington & Hildrew 1995). In common with other caddis families the larvae of the Hydropsychidae spin nets to trap food particles. For Hydropsychids these are usually in rapidly flowing water. In spring and summer these can be seen in abundance on moss covered stones. Edington, J.M. & Hildrew, A.G. 1993 Caseless Caddis Larvae of the British Isles. FBA. More information on caddisflies and caddisfly recording can be found on the Trichoptera Recording Scheme website. Caddisflies are a particularly under-recorded species group with many of the records in the SxBRC database only having been identified to genus, family or even only "caddis sp.". We would therefore really appreciate new, good quality records of these insects. The day began with an introduction from Sussex Wildlife Trust’s Michael Blencowe, filling in for Clare who was suffering from a minor dose of food poisoning and not quite up to the challenge of MC-ing the day. Clare gave just a very brief introduction to the contents of the 2018 ‘Adastra’ publication: the annual review of wildlife recording in Sussex, published by Sussex Biodiversity Record Centre. 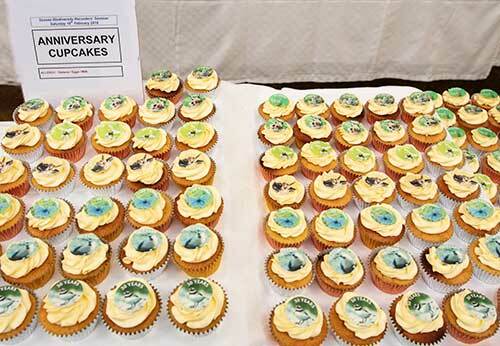 This year the publication has gone FULL COLOUR and Clare showcased a few highlights, including an article by Robin Crane on the origins of the Biological Recorders’ Seminar - 30 years old this year! 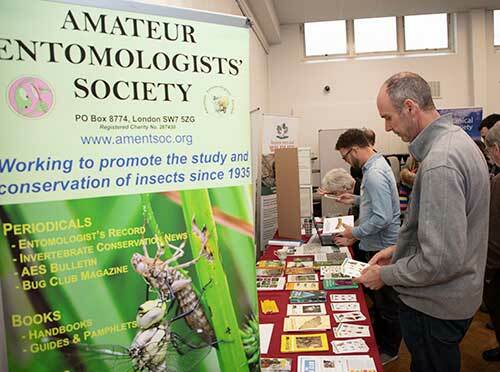 Tony Whitbread was the first to speak, giving an insight into the early days of the Biological Recorders’ Seminar back in 1990 and how, despite many mistakes in the beginning, the success of the seminar grew and grew to become the event we know now. Tony highlighted the importance of sharing our community’s knowledge and experience of Sussex wildlife, and using this to help preserve species for future generations. John Arnott, a volunteer with Chichester Harbour Conservancy, followed with a talk on the seals of Chichester Harbour. John explained how to identify seals and neatly summarised the research and monitoring that’s been taking place, showing how seals use the harbours at Chichester & Langstone, and the Solent. After a coffee break (with anniversary cupcakes!) and some time to look round the various stands, we were back with Martin Allison’s fascinating talk on the fungi of Lullington Heath including fairy rings, waxcaps and things that grow on sheep dung. Steph Miles and Jenny Peach from Royal Botanic Garden Kew Millennium Seed Bank then introduced us to three major projects - UK Flora Project, UK National Seed Project and the UK Native Seed Hub. It was great to hear how RBG Kew are supporting various conservation projects in Sussex. Over lunch, the hall filled with chatter, as people enjoyed the buffet lunch and refreshments provided by Diane and Harry’s team from Veg Out catering. Brad Scott then gave a talk about Bryophyte recording from 1721 - 2018, featuring the first known Sussex bryophyte record - Riccia fluitans - recorded by Johann Jacob Dillenius, and a short history of Sussex-based bryologists. The Sussex atlas project was initiated by Tom Ottley, with the aim to get 100 records per 1km square across Sussex. Good progress has been made across East Sussex where most society members live; progress in West Sussex is slower but there’s considerable improvement and the species list for Sussex is ever growing. Fran Southgate was delighted to share the news that otters are ‘Here at Last’ in Sussex. Her talk featured some lovely video footage of adult otters with young, showing us that they are now breeding in some areas of Sussex after a long absence. Fran went on to explain how to identify signs of otter, and how these differ from commonly confused species such as American Mink. Any possible otter sightings should be sent to bobforeman@sussexwt.org.uk for verification. Daniel Watkins from the Sussex Local Wildlife Sites Initiative talked about his progress since starting as the Local Wildlife Sites Officer last June, with Henri Brocklebank of Sussex Wildlife Trust describing the process of forming the initiative and how important the biological recording community and Sussex’s network of nature organisations are to the preservation of these sites. After a final tea break, Björn Beckmann talked gave us an overview of the National Grasshopper Recording Scheme and how data collection works through iRecord. Ralph Hobbs, iRecord verifier for Sussex Orthoptera records, provided some additional local context. Björn then gave an insight into the uses of this data in his PhD, and the challenges of working with casual recording datasets. 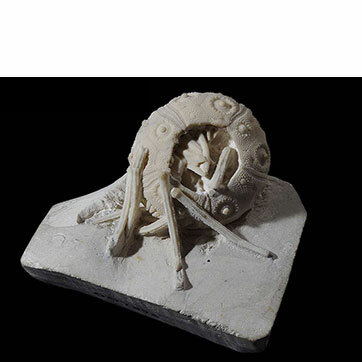 Finally, Emma Sherlock, curator at the Natural History Museum and chair of the Earthworm Society of Britain, gave an introduction to the world of earthworms and the challenges of setting up a new recording scheme. Emma’s brimming enthusiasm for these often over-looked creatures will hopefully inspire some folks to start recording earthworms in Sussex. After a final list of ‘thank yous’ to all the speakers, organisers, caterers and attendees, it was all over for another year! The date for the next seminar will be announced through the SxBRC newsletter and social media channels in the summer, and we hope you can all join us next February!